The Corinth Canal connects the Gulf of Corinth with the Saronic Gulf in the Aegean Sea. It cuts through the narrow Isthmus of Corinth and separates the Peloponnesian peninsula from the Greek mainland. 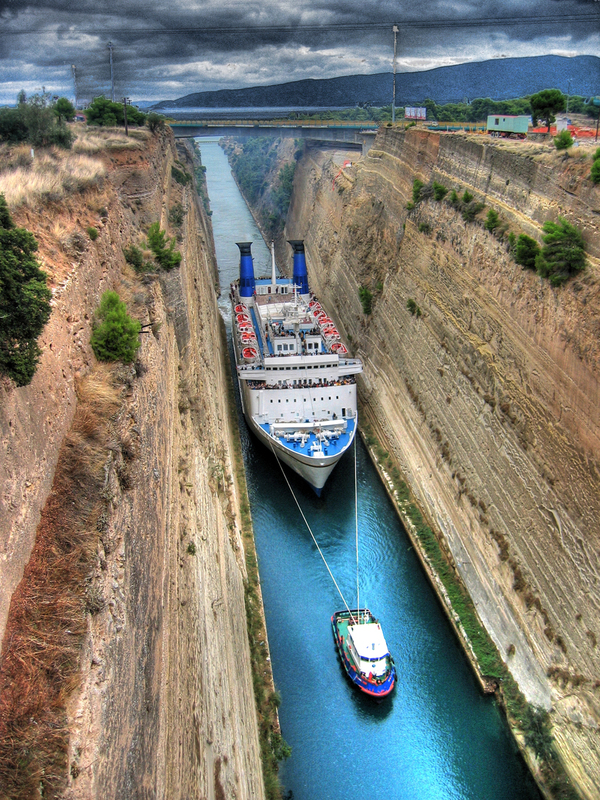 The builders dug the canal through the Isthmus at sea level; no locks are employed. It is 6.4 kilometres (4.0 mi) in length and only 21.4 metres (70 ft) wide at its base. The rock walls, which rise 90 metres (300 ft) above sea level, are at a near-vertical 80° angle. The canal is crossed by a railway line, a road and a motorway at a height of about 45 metres (148 ft).